Biological systems such as birds and humans are able to move with great agility, efficiency, and robustness in a wide range of environments. Endowing machines with similar capabilities requires designing controllers that address the challenges of high-degree-of-freedom, high-degree-of-underactuation, nonlinear and hybrid dynamics, as well as input, state, and safety-critical constraints in the presence of model and sensing uncertainty. In this talk, I will present the design of planning and control algorithms for (i) dynamic legged locomotion over discrete terrain that requires enforcing safety-critical constraints in the form of precise foot placements; and (ii) dynamic aerial manipulation through cooperative transportation of a cable-suspended payload using multiple aerial robots with safety-critical constraints on manifolds. I will show that we can address the challenges of stability of hybrid systems through control Lyapunov functions (CLFs), input and state constraints through CLF-based quadratic programs, and safety-critical constraints through control barrier functions. I will show that robust and geometric formulations of control Lyapunov and barrier functions can respectively address adverse effects of model uncertainty on stability and constraint enforcement on manifolds. 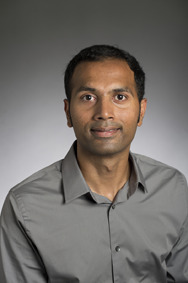 Koushil Sreenath is an Assistant Professor of Mechanical Engineering, at UC Berkeley. He received a Ph.D. degree in Electrical Engineering and Computer Science and a M.S. degree in Applied Mathematics from the University of Michigan at Ann Arbor, MI, in 2011. He was a Postdoctoral Scholar at the GRASP Lab at University of Pennsylvania from 2011 to 2013 and an Assistant Professor at Carnegie Mellon University from 2013 to 2017. His research interest lies at the intersection of highly dynamic robotics and applied nonlinear control. His work on dynamic legged locomotion on the bipedal robot MABEL was featured on The Discovery Channel, CNN, ESPN, FOX, and CBS. His work on dynamic aerial manipulation was featured on the IEEE Spectrum, New Scientist, and Huffington Post. His work on adaptive sampling with mobile sensor networks was published as a book entitled Adaptive Sampling with Mobile WSN (IET). He received the Best Paper Award at the Robotics: Science and Systems (RSS) Conference in 2013, the Google Faculty Research Award in Robotics in 2015, and the George Tallman Ladd Research Award in 2017.